Don't abandon your hike or camping trip if the weather looks dreary. Bring The North Face Dryzzle Jacket along and stay comfy even if the skies open up. This comfy shell brings GORE-TEX® Paclite® weather protection to your summer adventures. The fabric offers the trusted waterproofing and breathability in a light, packable design that's easy to make room for in a backpack. 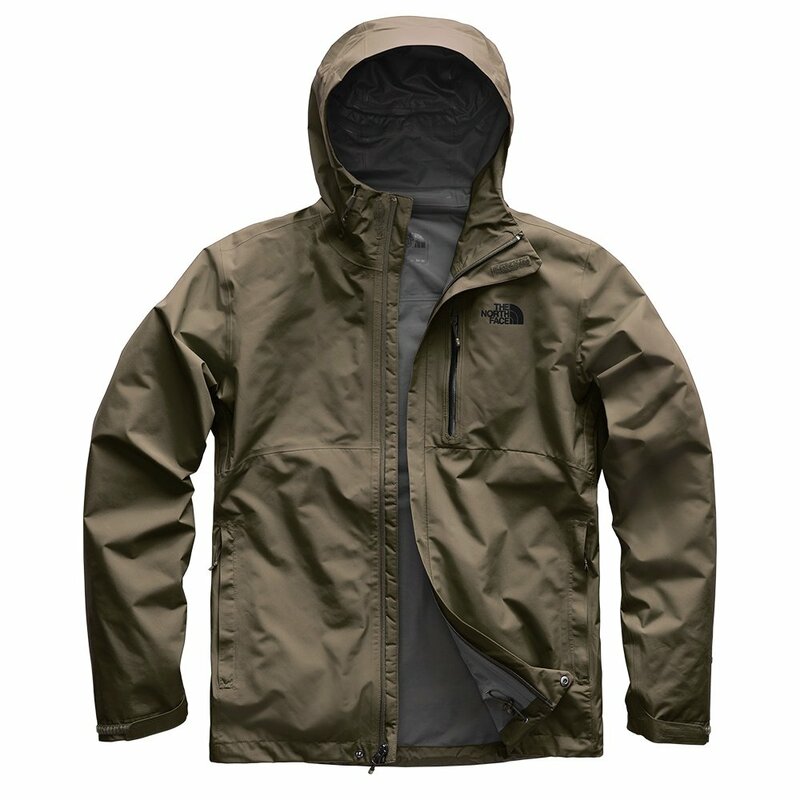 Just like a winter shell, this jacket has an adjustable hood, storm flap closure, and hem cinch cord. Pit zip venting and media-compatible design enhance its all-around performance. "does the hood zip off or roll into the collar?" "The hood is attached. It has a draw cord in the back for adjust-ability. " "What size Dryzzle is the model wearing in the video?" "Thank you for your inquiry. The model wearing "The North Face Dryzzle GORE-TEX Rain Jacket" is none other than our very own Chief Testing Officer and Olympic Gold Medalist Jonny Moseley and the size he is wearing is a large. We hope this answer helps with your Peter Glenn selection and purchase." "What's Johnny Moseley's chest size? What size Dryzzle Jacket is he wearing in the video?" "We do not have the exact measurements of his chest but we do know he was wearing a size Large jacket in the video. We hope this information helps! " Goretex jackets never fail to impress me, it can keep you dry in harsh weather conditions and it's super valuable price makes it even better. I loved this jacket until it started falling apart. The seams around the neck are coming unglued. This jacket was way too expensive to be falling apart after only a half season. I want to send it in to get fixed But the 6 week turnaround is way too long for the PNW rainy season. Excellent lightweight jacket. Made for active people. This jacket does not disappoint. Excellent lightweight jacket. Definitely made for the active people. The construction of the jacket and materials are high quality. Seams and stitching are strong. Material is a high quality lightweight softshell that is very stretchy and comfortable. It also breathes pretty well, can block some wind, and somewhat water resistant. However, there is always a trade-off between water resistance, wind resistance, and breathability. Really like the high neck to keep your neck warm. North Face makes great quality stuff. I have had quite a few things from North Face and it always outlasts other comparable stuff I have. I seriously have been looking for a jacket like this for a while. Improvements: If they had a slim version that would be great. Also, if the sleeve cuffs maybe have adjustable velcro. Not the lightest rain jacket but protects great against the wind and rain. I've worn it hiking multiple times in rainy, windy weather and it held up great. Perfect outer shell jacket for any occasion, very waterproof and easily packable. Kept me dry on a week long fishing trip and also helped to manage mosquitoes without becoming too hot. I am getting ready to camp out for a week in Canada. It is going to be cool, along with a chance of rain. I had to get this jacket for this trip. I needed a jacket that could keep me warm and dry. This is just the jacket. I bought this jacket for my dad. He already has one, and he loved it so much that I bought him another. My husband and I also have dryzzle jackets, and have taken them backpacking. They are awesome! This is an excellent product and I would recommend it to anyone looking for a lightweight jacket. Good product. It is stylish, thin/lightweight, and durable. Only problem is it seems to big and can seem a little plain. Overall nice rain coat. So far this jacket hasn't let me down on its performance in the rain. It's lightweight, breathable, and packable. If you're looking for a solid hiking jacket this might be the one for you. I'll get to put it to the test on the Superior Hiking Trail soon here in July! Great raincoat, would totally buy again! Love the jacket, it meets every need for a lightweight rain jacket for variable weather. Great jacket! its Gortex so you know its proven to work. Very lightweight and 100% waterproof but breathable for hotter weather. Can also keep you warm in colder weather as well from the windproof design. I live down in Florida and its perfect for me and all out door enthusiasts. I just purchased this jacket. I took it with me to leave in my Jeep whenever I need it. I went to my son's Lacrosse game. The temperature dropped 25 degrees, the wind picked up and it started to rain. I ran to the Jeep and got my jacket. It was the perfect answer to Cleveland's unpredictable Spring weather! Really like this jacket! I am 5'9 /165 lbs, usually wears M from Northface, but this one I need to get a size S.
It is really well made and comfortable. Overall this jacket is great if you want a light, super packable shell with the reliabilitliy of gore-tex. I haven't put it through the ringer yet, but the worst weather I've dealt with was about 4 hours of rain and aside from some minor saturation, the waterproofing held up. Great jacket and will definitely keep you dry. I'm 5'8 170lb with athletic build and like my jackets a lightly snug. The medium fits me perfectly.